The response shows the bimodal distribution with as expected the s-cis conformation dominating. 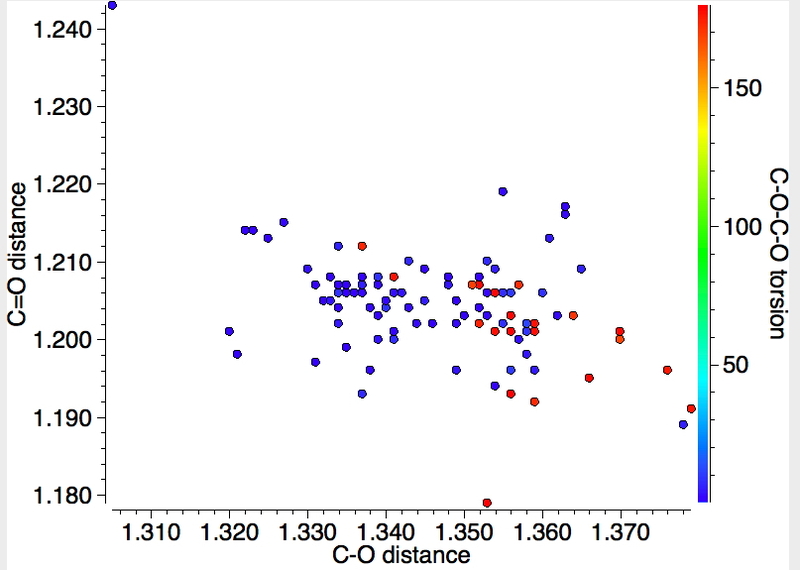 There is indeed a hint that for the s-cis, the C-O distance is rather shorter than for the s-trans conformation. Repeating the search, but specifying that the temperature of data acquisition is < 90K, one gets a much clearer indication of the difference in bond lengths. 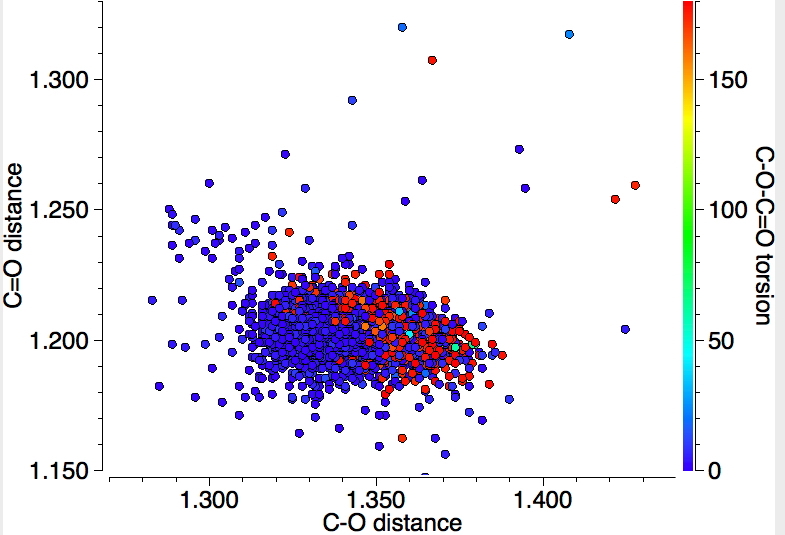 This alternative representation shows the C-O and the C=O distances, with red indicating s-trans and blue indicating s-cis conformations (T < 140K). 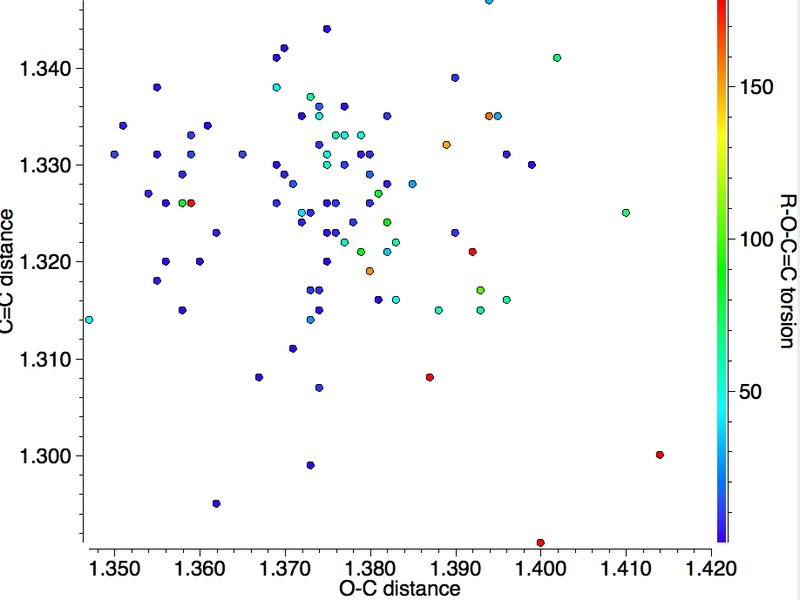 The red dots occupy a bottom right cluster for which the C-O distance is longer and the C=O shorter than the corresponding blue cluster. Again reducing the temperature of data collection to < 90K shows a rather weak inverse correlation between the two distances for eg the blue dots. A shame however that this database does not hold IR values for the carbonyl stretches. I am sure correlations must exist, but how to get at them (other than manual collection of data). This entry was posted on Saturday, June 18th, 2016 at 9:43 am and is filed under Chemical IT, crystal_structure_mining. You can follow any responses to this entry through the RSS 2.0 feed. You can leave a response, or trackback from your own site. 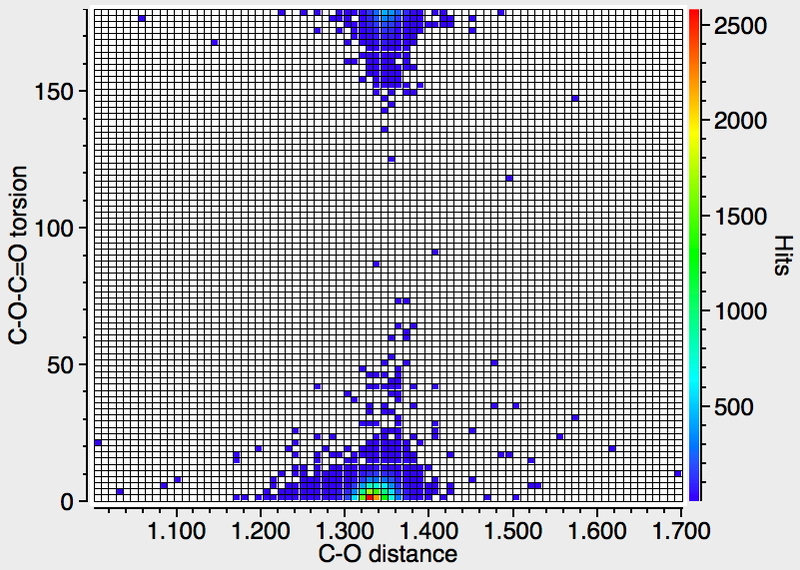 Here is a plot in which the C=O of the ester is replaced by C=CRR’ (where R or R’ can be either H or a 4-coordinate carbon). In addition the C-O-C= is replaced by R-O-C=, where R can be either 4-coordinate carbon or silicon. This is now an enol rather than an ester. The effect is less clear-cut for these enols, largely because there are only 71 examples of crystal structures for such systems. 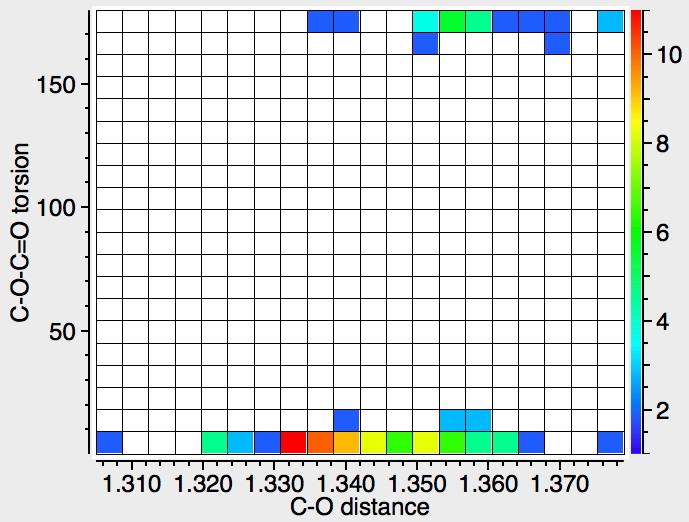 Nevertheless, the red dots (s-trans) are mostly clustered in the bottom right and the blue dots (s-syn) mostly in the top left, just as with the esters. 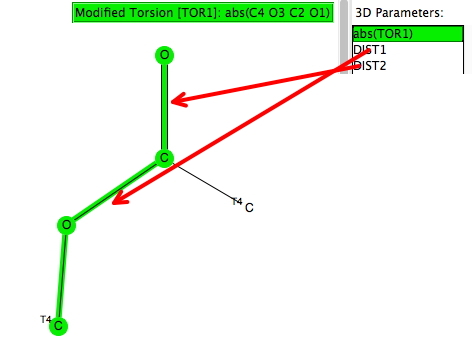 Why is the carbonyl IR stretch in an ester higher than in a ketone: crystal structure data mining. is licensed by Henry Rzepa under a Creative Commons Attribution-Noncommercial-Share Alike 3.0 United States License.